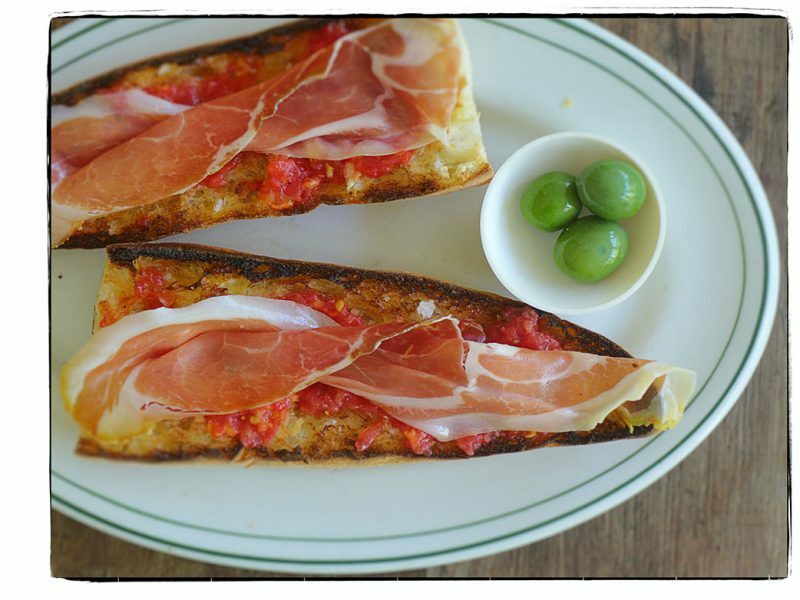 Today we’re having the most obvious summer lunch—pan con tomate. Olé. With Labor Day bearing down, we are indulging ourselves in the last days of summertime. 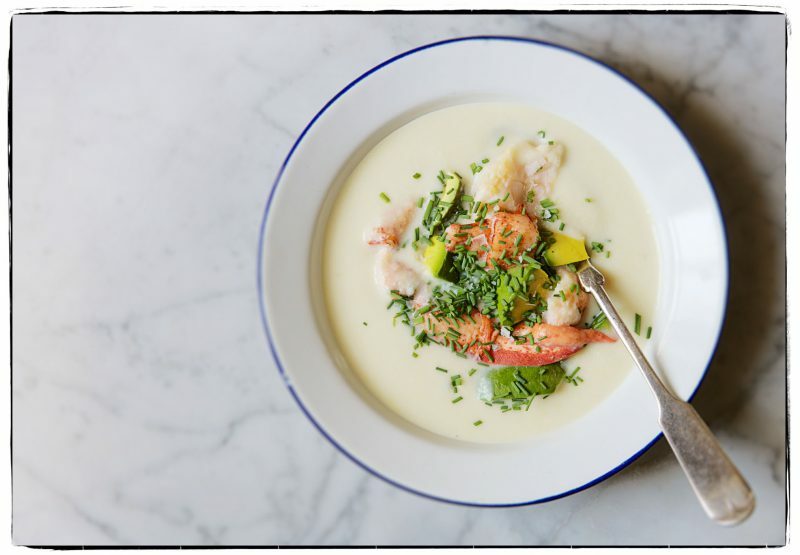 Our lunch today says it all—white corn soup with lobster and avocado. Late summer yellows are everywhere now—blooming in the fields and beside the road—and in the garden. 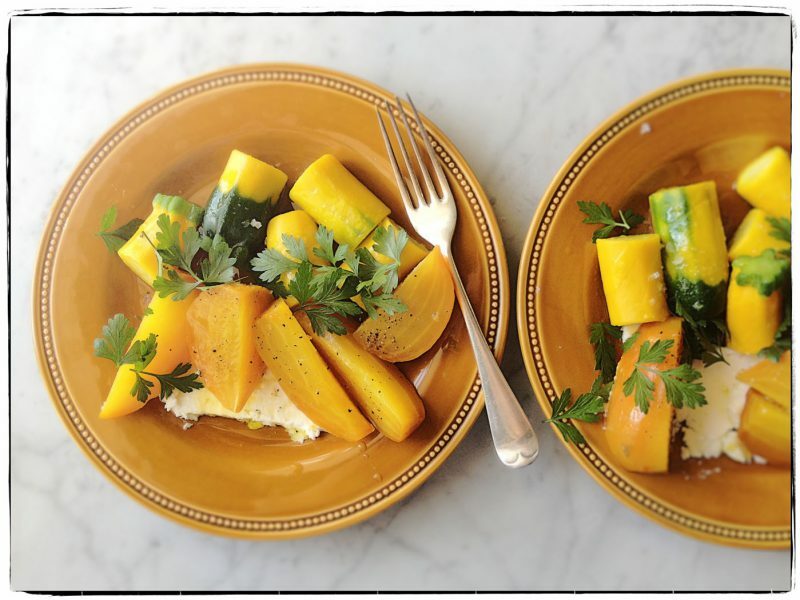 We’re ingesting the glorious color with a lunch of golden beets and yellow zucchini with French feta, extra-virgin olive oil, parsley, and some salt and pepper. This morning we picked blackberries at Manoff Market Gardens—we’re making berry jam to keep for winter. The market gardeners tipped us off to head to the end of the row and go for the bodacious Apache variety: big berries, whole lotta flavor. 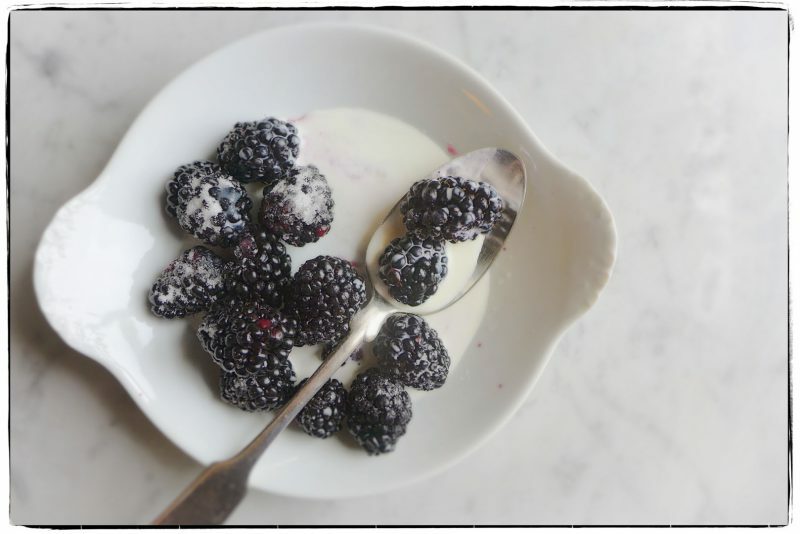 We couldn’t resist, so lunch today is sugared blackberries and cream. 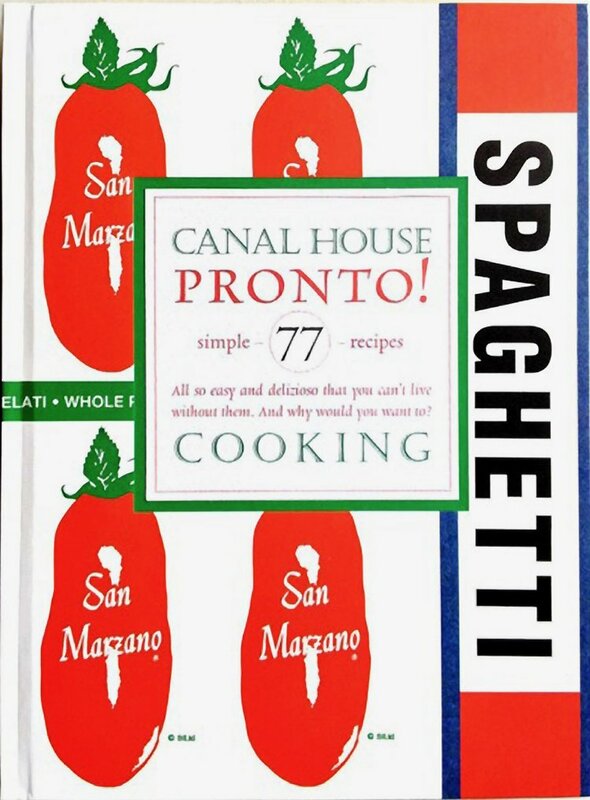 Make something delicious for yourself this weekend, dear friends. 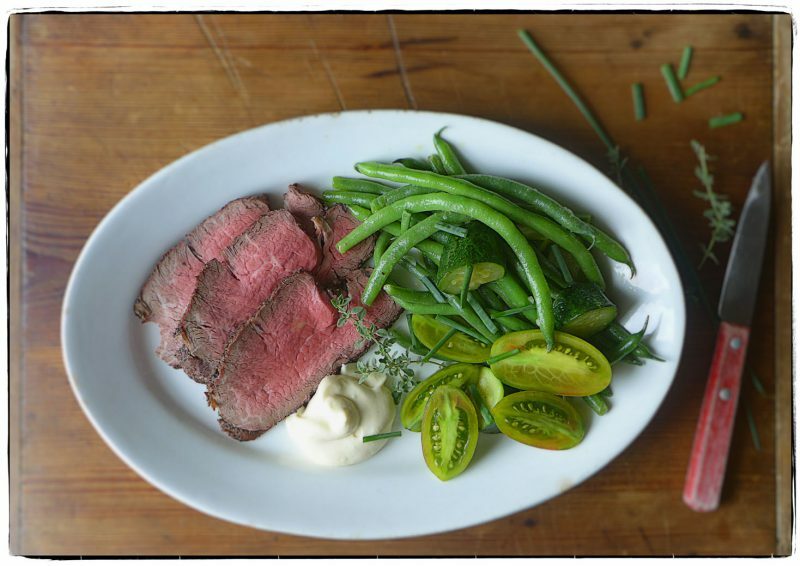 Today’s lunch—cold grilled filet of beef with a mustard mayonnaise and a tangle of green beans, zucchini, and sweet green tiger tomatoes dressed in a lemony vinaigrette. It’s summertime and the eating is easy. 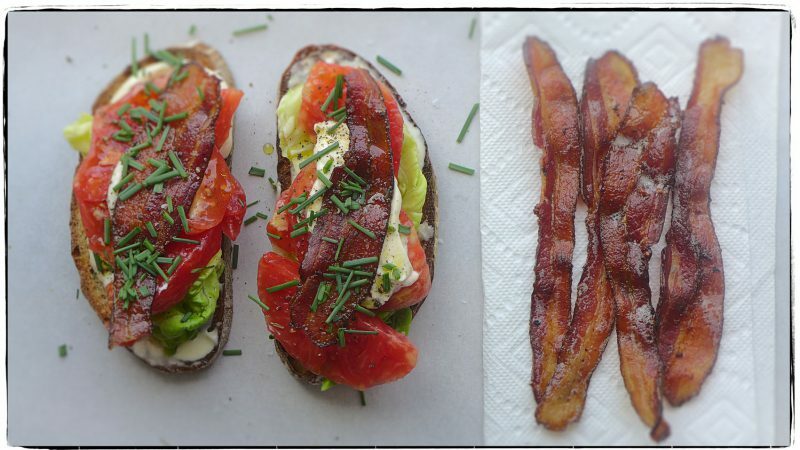 We still have a mad craving for BLT’s. After all, this is the tomato’s moment in the sun. We have been wolfing down scads of the red beauties, drizzled with vinaigrette, dolloped with mayo, adorned with minced chives. We’ve even taken to serving our salads with spoons so that we can slurp up every last drop of juice. So today, lunch is a gastronomic harmonic convergence—peeled dead-ripe tomatoes, good crisp bacon, butter lettuce, mayonnaise, chives, and salt and pepper piled on toasted country bread to sop up all the lusciousness. We ain’t gotta barrel of money, but we sure do eat like we do! 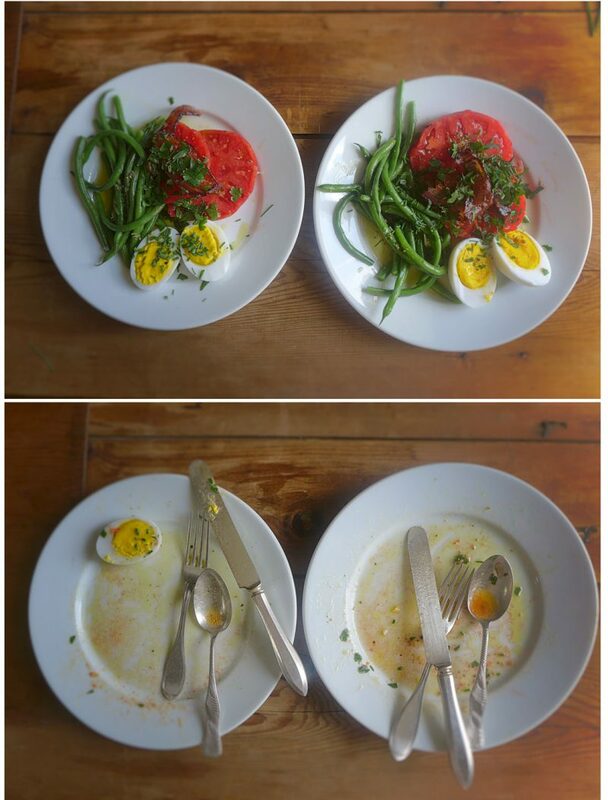 We had our minds set on BLTs for lunch today, but a turn here and a turn there, and somehow we arrived at this heavenly combination instead: peeled and sliced (finally red, ripe, and juicy) tomatoes, blanched string beans, hard-boiled duck eggs (their yolks are divinely rich and flavorful), crisp Nueske’s bacon, and snipped chives and parsley with a garlicky vinaigrette. We grabbed spoons at the end of the meal to scoop up all the juices left on the plate. Nirvana! 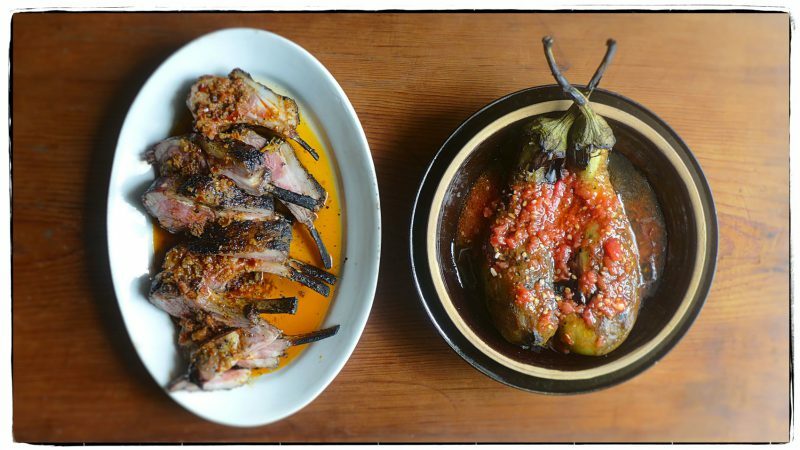 As we were standing by the charcoal fire this afternoon, grilling lamb chops, blistering eggplant and tomatoes, and dodging the smoke, we realized today’s lunch is about fire and sauces, the comingling of smoke and assertive flavors—they belong together. So we are feasting on A Pile of Grilled Lamb Chops Scottadito and Eggplant Cooked in the Coals with a smoky grilled tomato vinaigrette. Get your grill on before the leaves fall. 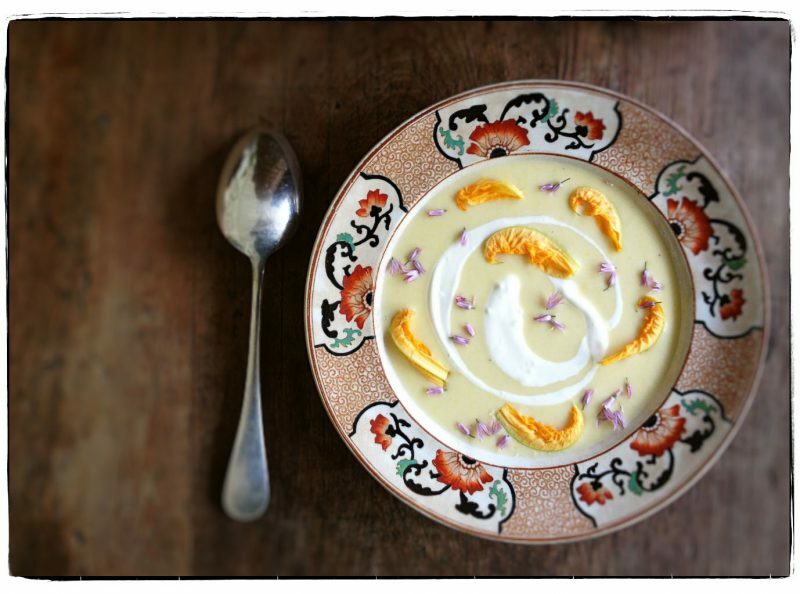 Today we are enjoying the fruits of our weekend labor—Cold Corn Soup with a swirl of sour cream and squash and chive blossoms just because. 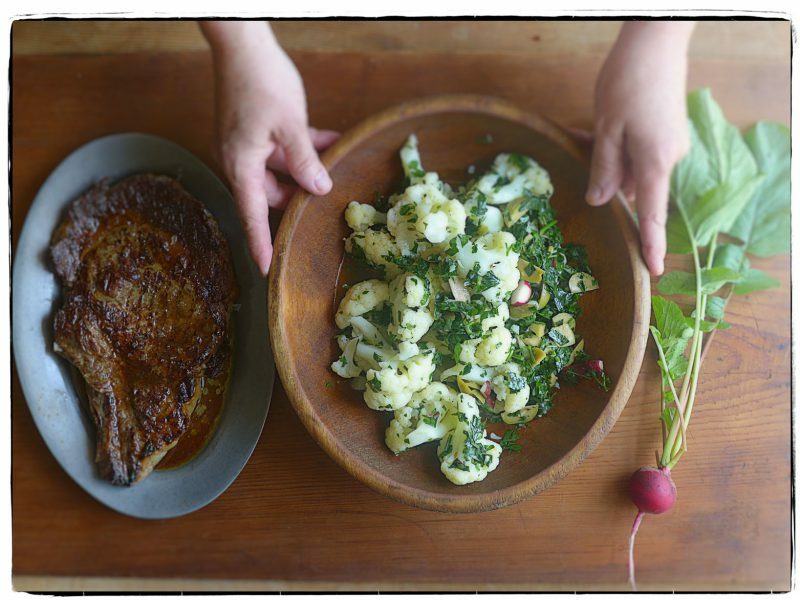 Here’s how we made it: We cut the kernels off twelve ears of bicolor corn, chopped up two bulb onions, peeled and diced two russet potatoes, then simmered the lot, along with the cobs, in a half gallon of whole milk until the potatoes were soft. We seasoned it with some crushed red pepper flakes and good ol’ s & p. After puréeing it all (minus the cobs, of course) in a food processor, we double strained it. Smooth and silky, sweet and savory, we must say, it may be the best summer recipe so far—maybe. As delicious as it is pretty, it’s an elegant way to start the work week. By the way, is anyone working, or is everyone at the beach? Which came first? The chicken or the succotash? Maybe it was the corn and lima beans we had bought at the farm market this morning? Or that we already had two plump chicken breasts in the fridge? 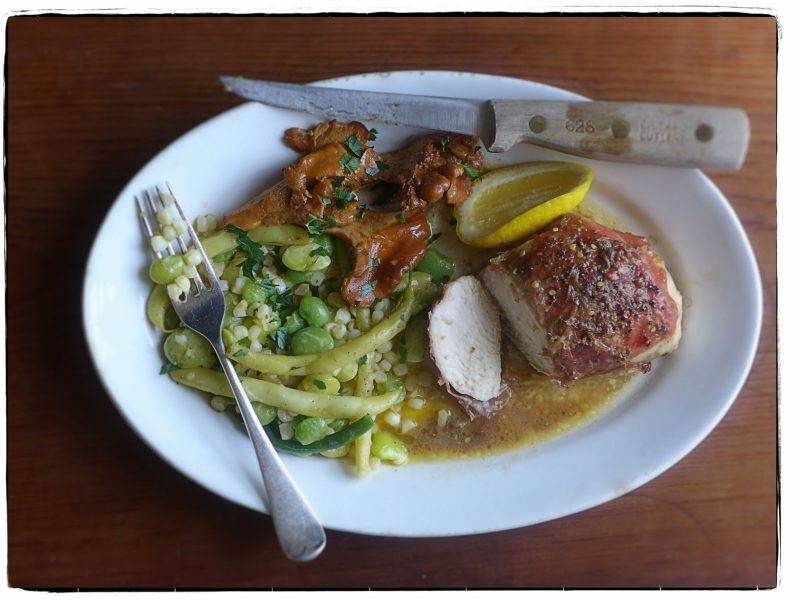 Hard to say, but we’re eating the Chicken Wrapped in Prosciutto with Anchovy Butter, some sautéed meaty chanterelles, and a succotash of wax beans, limas, and white corn with a fork and knife, plus a spoon to scoop up all the delicious, savory juices. Have a wonderful weekend, dear friends. 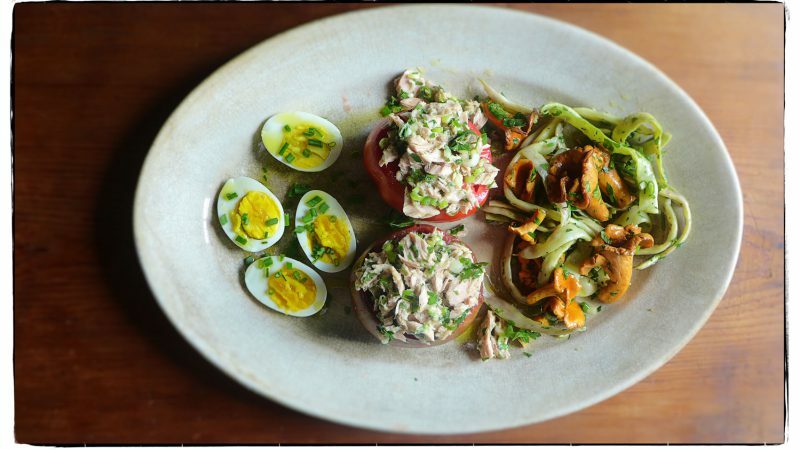 Enjoy summer’s bounty and cook something delicious for yourself. Today we we pulled the very last radishes from the garden. We needed them to finish today’s lunch, Cauliflower Salad with Green Olives, Radishes (needless to say!) & Parsley. We served a grilled steak on the side.